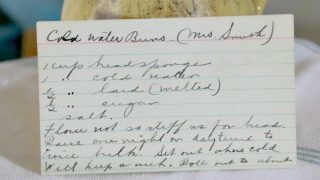 Front of the recipe card for Cold Water Buns. There is a notation stating it is from Mrs. Smith. Be sure to read the instructions on this one carefully as for me it didn’t make sense the first time. The sponge and dough method is a two-step bread making process: in the first step a sponge is made and allowed to ferment for a period of time, and in the second step the sponge is added to the final dough’s ingredients, creating the total formula. In this usage, synonyms for sponge are yeast starter or yeast pre-ferment. In French baking the sponge and dough method is known as levain-levure. The method is reminiscent of the sourdough or levain methods; however, the sponge is made from all fresh ingredients prior to being used in the final dough. 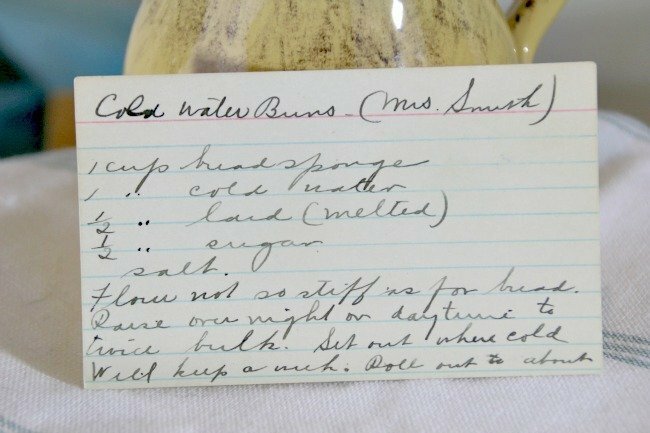 There are lots of fun recipes to read in the box this recipe for Cold Water Buns was with. Click here to read the history of VRP012 – Wood Box. Use the links below to view other recipes similar to this Cold Water Buns recipe. If you make this cold water buns recipe, please share your photos and comments below! Flour not so stiff as for bread. Sit out where cold will keep a week.